Every time I read of a home invasion robbery, or an in-the-window abduction of a sleeping child, I feel angry and also frustrated. Why should we be so vulnerable in our homes? I’m annoyed with architects. Why aren’t they designing homes in which we can at least relax and feel safe? If architects won’t do their job, I’ll volunteer to step in and do it for them. Here’s an inverted, upside down single-family home. Do you see a problem with this? Do we really need windows on the first floor? Burglars, rapists and child abductors will not find it easy to get in! The tapered walls on the building shown on the left could even be coated with grease. Not shown are support pillars, embedded deep into the subsoil, that support the building and also afford space for a small basement. In case of fire, occupants either exit from the front door or jump from second-story windows into soft, deeply-tilled soil covered with ice plant or similar soft bedding plants. Note how bushes, potential hiding places, are few and kept trimmed small. If living in an upside down home seems restricting or strange, there are other design solutions that can at least minimize one’s interaction with strangers, especially ones who might have criminal intent. Just as gas stations and mini-marts provide slide-out trays and bullet-proof glass to protect their employee-attendants at night, so can a Home Solicitor Interrogation Room be added to a single-family residence. A plus feature, not shown in the illustration, is the electronically-lockable front door. The resident, safe inside the home, is able to lock a criminal or criminals inside the tiny entry room, creating a holding cell until police arrive. 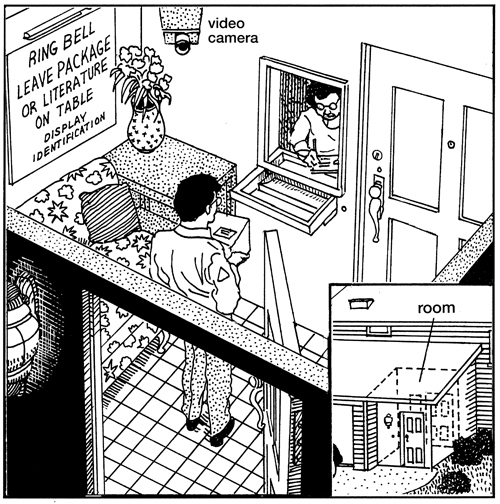 Another type of holding cell can be located underground directly in front of a fake front door. The real front door is located elsewhere, its location known only to friends and family. If the resident doesn’t like the looks of a person, he or she presses a button causing the porch to collapse into the cell below. Not shown is the ample padding that lines in the floor and wall of the brick-lined holding cell. 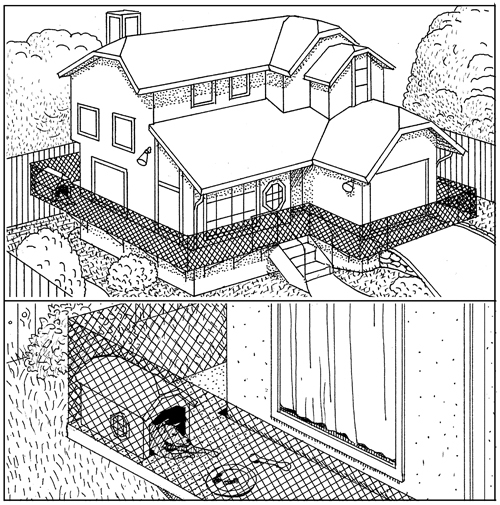 A deceptively simple yet effective design is the Home Perimeter Dog Run. Rather than setting an alarm when leaving the home for the day, or when retiring to sleep at night, the resident unlocks an interior gate, giving the dog full run of the entire balcony. Dogs are very sensitive to sounds and vibrations, especially those made by strangers. Should a criminally-inclined stranger step anywhere on the metal walkway, a large dog would leap out of its house and attack. I worked on the problem of home invasion over several decades. 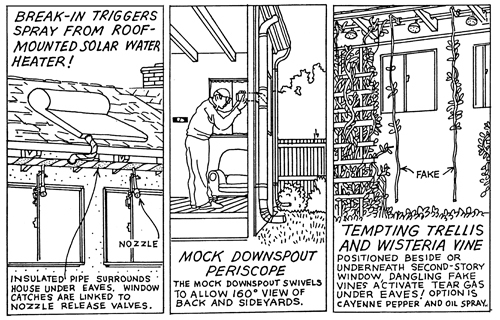 The solutions that are shown above, drawn in the mid-1980s, seem silly today, but that was before there existed sophisticated home security systems with night-vision cameras, body heat detectors, and web cams. A Swimming Moat would offer an opportunity for residents to relax in their pool, do laps or invite friends and neighbors over for a pool party. 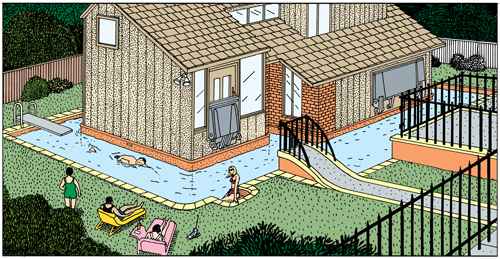 But at night, or when homeowners are away from home, the pool becomes a moat. Drawbridges are raised. Unauthorized entry is effectively discouraged, since burglars do not wish to contemplate climbing slippery walls in wet running shoes, balancing delicate electronic appliances overhead. Posted signs suggest the added possibility of serious electric shock. The sign would be false. If it were not, cats, dogs and squirrels – or drunk revelers who climbed the fence – would be electrocuted. 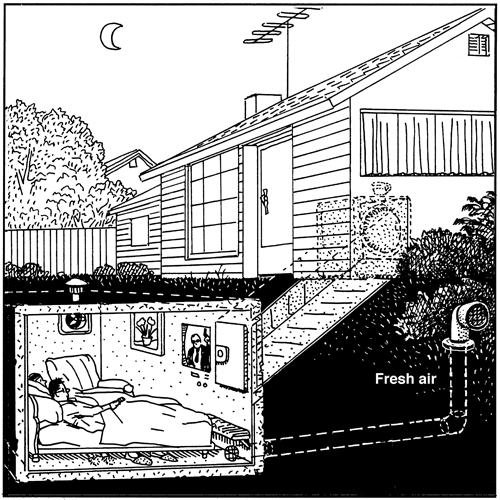 My favorite solution is the Underground Bedroom. The bedroom, located anywhere on the property, is approached through a secret passageway. In this example, residents enter at night through the door of a stacked washer-dryer machine (fake) and crawl down a sloped ramp. The bedroom is stocked with food, television, computer, VCR, phone and a very small toilet. This room is the quietest in the house. What? Coat the walls with grease? Forget about fire safety as long as you keep the burglars out. The NEATORAMA commenters are a sharp-eyed bunch, many of whom are intent on educating me by pointing out the flaws in my concepts. I am glad they are on their toes. 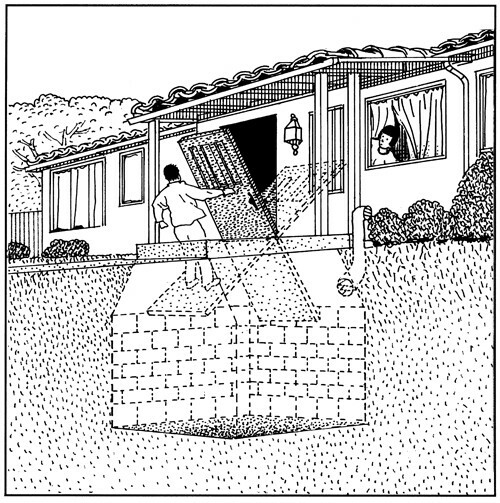 But I have to laugh at Staxeon's remark that my cartoons would be against building code. 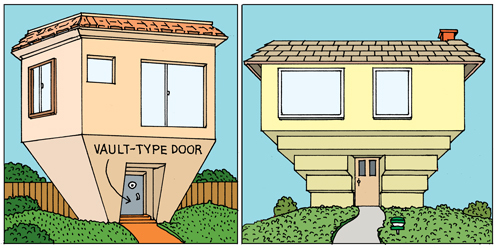 Is there a building code for cartoon buildings, I wonder? I must say, though, that I'm quite astonished at the number of people who can't get a joke even when they're told it's a joke!! i'd rather just live in a house that looks like a castle, has a courtyard and all the exterior windows are small. Where I live I think all of these improvements would be against building code. "The Enemy at the Door"